What’s the secret of the success of Google, Apple, Amazon and Facebook? They took a single business model and evolved it in dozens of different directions. Rather than fighting for market *share*, they all did a fantastic job of *exploding* their market *size*. Talk about business model innovation! And you don’t have to be a 50 billion dollar company to do the same. 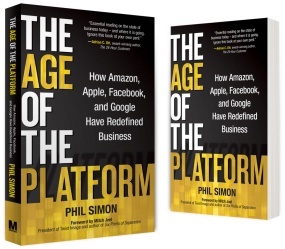 I caught up with Phil Simon, author of Age of the Platform, to learn from him what the most important lessons are for *you* to learn from these four giants. Over the course of 45 minutes, he shared his insights into their success. Enjoy! Danny’s book: Engagement from Scratch! Tip #1: It’s important to attempt branching out. If it doesn’t work you need to back off – but you have to try. Tip #2: Just because you’re a small business doesn’t mean that you can learn from big companies – there are important lessons if you take the time to pay attention. Tip #3: Just because you branch out doesn’t mean you abandon what you’re good at. Keep it up but prepare for change. Tip #4: Before anything else have a good, professional website. Tip #5: You can use existing platforms, like social media, podcasting and video, and make them planks of your own. Tip #6: Any business can strike a balance between maintaining their core competency and forging new planks in their platform. Tip #7: When evaluating a new idea, first look at the risk and the potential cost of failure. Tip #8: Just because you can do something, doesn’t always mean that you should. Tip #9: Spend some time trying to look at your business, starting with your online presence, objectively and decide if you’re ready for change. 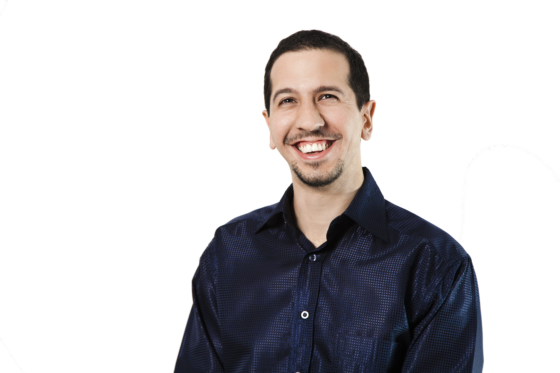 Danny: Hi Everyone, welcome to Mirasee to 4 questions of marketing month. This week we’re talking about market size and I’m very happy to have on the line with me Phil Simon, author of the Age of the Platform and a whole bunch of other really interesting books. Phil, thank you very much for being with us here today. Danny: So let’s start by – you wrote this book, the Age of the Platform, your other book, I believe is called The New Small. Before we dive into any specifics or strategies or tactics or anything like that, could you share just the nutshell overview of who is Phil Simon and what’s he all about? Phil: Sure, long story short Danny, I pride myself as being able to understand people, organizations and technology and the writing has really coincided with the intersection of those three courses. So my first book, Why New Systems Fail came out in 2009 and I joke with people that if I didn’t write that book I would have needed to see a shrink, and I kind of got the bug with writing and put out a book about technologies a little bit later and then The New Small, the Age of the Platform and a slightly over a year ago, so some would say that I have moderation issues. Danny: So the, the subject of this, this week in the 4 Questions of Marketing feature is market size, and this is a little outside the box of what people usually think of when they think of marketing. People usually think of marketing as market share, you know, promotion, getting the word out, competing with everyone else on the landscape and so forth. Can you explain briefly, you know, when people talk about growing market size, what does that even mean? Phil: Well I suppose that it’s about expansion and when I think about expansion, I can’t think of four better examples then the companies profiled in the book Amazon, Apple, Facebook and Google because we could go line by line, but just starting in alphabetical order, Amazon in 1994 was an online bookstore and 17 or 18 years later it is now an incredibly powerful platform company that does everything from selling books and CDs and compact disks and movies to selling compute power to small businesses to manufacturing hardware to publishing books. Amazon has its toes in the pool of a number of different industries. You know Google in 1998 was a search engine, but it became a platform by adding Gmail and Blogger and YouTube and Google maps and Google docs and all of these different planks in the platform so, by virtue of that these companies really have expanded their market sizes. And in the took I profile apart from the gang of four, Amazon, Apple, Facebook and Google, other companies that have embraced platforms and planks and ecosystems and as a result can reach so many more people in so many different ways that it certainly warranted a book, so that’s the book in a nutshell. These are the market size and expansion. Danny: Cool. So I want to share with our listeners just a bit of the back-story of how we, we connected and how we came to be doing this interview because, you know, as I was putting together this 4 Questions of Marketing feature, I was out there looking for who can I talk to about all these different questions, and I was particularly stuck with the market size question. I mean the idea of growing market size is not new. It’s what any market leader does, historically right? I mean when Budweiser is advertising they’re not trying to get more people to drink Budweiser, they’re trying to get more people to drink beer, because they know they take 40% of the market, so, you know lots of people get into the market they take 40% of that. So it’s not a new concept except that, you know, our target audience is not Budweiser. It’s not, you know, giant, enormous companies, in the other case of where do you want to grow market size is when the market is still kind of nascent and growing. And, you know, it’s in everyone’s interest, it’s a lot easier to get people into the game then to try to steal customers from someone else. You know and a really good example that I stumbled on to the other day is the world of online split-testing, right? You’ve got Visual Website Optimizer and you’ve got Optimizely as two of the leaders in the space, and rather than kind of fighting each other, they just want to both grow awareness about you know most, “more people should be split-testing” because there is just that much more opportunity there. And the people who are doing this best of course, as you know, it’s Google, it’s Amazon it’s Apple, it’s Facebook, and I’ve been in touch with Cathy very peripherally, Cathy is your publicist. She’s been just sending me you know here’s a great book you might want to look at and review or something for the last six months, like, literally the same day that I’m like: “Okay, who in the hell am I going to find to talk about this?” she sends me a link to your book, she’s like: “would you be interested in doing an interview?” I’m like: “actually yeah, that’s a perfect fit.” So just you know spectacular little coincidence. Phil: It’s great that she put the two of us together and I think that we can talk about growing market size but we can also talk about the ways these companies have done it and one of the key differences I would argue in the Age of the Platform is that things happen in a much more organic nature then they did certainly thirty or forty years ago, but regard to advertising, say Budweiser, I think that’s a great example. Sort of taking that into the digital space for a moment, Google got tremendous benefit and increased value by something like 50 billion dollars just because of the fact that Google is now, and has been since 2001, an officially recognized verb from the Oxford English Dictionary, and the interesting story for the listeners who may not know is that that actually happened very organically. So around 2001, 2002, people started saying you know: “we’ll just Google it” ,and that became a verb. And that all happened again from the bottom up whereas companies like Microsoft now, and I have no axe to grind with Microsoft, but they’re spending hundreds of millions of dollars on advertising for Bing getting people to “Bing it” and it’s just top down, it seems synthetic isn’t not catching on, I never hear of any of my friends ever say Bing it but when I go to a tech meetup or when I do a speaking gig I’ll always hear people say: “oh just Google it” or “Google me”. So it is a very sort of fundamentally different way of expanding market share it is much less about an it and buying billions of dollars of ads putting them on 3 or 4 TV channels and reaching a majority of countries. And it’s much more about a sort of bottom-up nature so when you see someone on an iPhone or an iPad or using an Amazon Kindle or Kindle Fire, there’s a curiosity there, you ask a stranger: “do you like this? What do you like about it? What’s your favourite app?” and it does sort of take hold at a much more organic way. Danny: Actually in a lot of things have just changed, you can’t force these things the way you used to. The access to the undivided attention of hundreds of millions of people just doesn’t exist anymore. I think a stat that I, that really jumped out at me it’s like: “boy these people have money to burn!” It just jumped out at me in reading your book you were staying that the stats on return on investment for Bing advertising including like, for every 3 dollars that they spent to advertising and promote Bing they’re making 1 dollar in ad revenue? Phil: They’ve actually narrowed the gap recently, since the book came out, it came out a little over 4 months ago that gap has been narrowed, but again if you look at the statistics for search, Google still controls about 60% of the US search market, and Google, I want to say about a 3 to 1 lead over Microsoft, I think that Bing has about 22% and it’s just a real challenge. I mean, Microsoft’s playing catch up and it’s not like Microsoft can make an acquisition to get itself into the search game. I mean there have been, there’ been some talk about doing some more with Yahoo! and maybe making another search engine acquisition. But Google has become the de facto standard for search and it works and it’s simple and it’s effective and how do you surpass that? It’s just a real challenge, I don’t think the answer, to your point, Danny, is to throw more marketing spend at it. Danny: Well no, and I think it’s instructive to look at the way Google kind of rose to power quote unquote in that they didn’t look at the com – I mean it’s not like there weren’t search engines at the time, they just weren’t very good. It’s not like they launched onto the scene they were brand new and there were other search engines but they didn’t come into the scene and say: “Okay, how can we steal people away from Yahoo! or Alta Vista?” or whatever the other engines were that I can’t even remember, you know at the time. They said how do we grow the search game? How do we make search so good that so many more people are going to want to do it. Right? It was about growing market size which I think is fascinating, it’s a whole different paradigm. Phil: Larry Page once famously said along those lines Danny, that: marketing is the cost for bad products, and I think that that’s some very wise statement because if you build a better mousetrap, again it is tough to get noticed it’s certainly the landscape is more littered with start-ups these days than maybe it was you know five, six years ago, it doesn’t cost this much to start a company something that I talk about at length in The New Small, my last book. But if you make a good product it is very easy for a buzz to start with social media or something to catch on, on Twitter or people will start telling you on Facebook because I would argue from a marketing perspective word of mouth is still king and in the age of the platform, that is not different. Someone tells you: “hey, you’ve got to check out Phil’s book” and you trust that person and you should check out this website, that’s going to be considered and possibly viewed much more often that if you get just an anonymous spammed email in your inbox I mean what are the odds your actually going to open that up and act on it, much less recommend it to a friend. Danny: Well no, and not only does word of mouth still matter, I’d argue that it matters quite a lot more because we trust people every bit as much as we did before, you know, our friends our family, etc., we trust brands dramatically less and everyone has a megaphone to, to magnify their message, so, you know your friend who, you know, 20 years ago would have told three people can now tell thirty and you still trust it the same why, whereas the brands, you know, and the ability to reach lots of people has dropped dramatically, and when they do reach people they aren’t trusted anyway. Phil: It’s for that very reason that I think Google was justifiably concerned about Facebook. Think about it. I have a storey like tell my friends about a year and a half ago I was thinking of making the switch from a pc to a Mac, and yeah, I could have Googled it, but instead I threw it up on Facebook, “thinking of switching over to a Mac, what do you think?” And within an hour twelve of my friends responded with: “we know you, you’ll love it.” And you know what? I bought a Mac and they were absolutely right. O that’s a search that didn’t take place on Google, that’s revenue that didn’t come through the way of AdWords, or AdSense or however it would have been monetized, so it sort of shifting notion in the age of the platform that I think I’ll be, I won’t say a need, but you shouldn’t be complacent, and I think that’s it’s extremely instructive to look at a company like Google who’s founders are very much believers in Clayton Christensen’s book The Innovator’s Dilemma or in other words and Steve Jobs said this in Isaacson’s book your business is going to cannibalize. The only question is: who is going to do it, you or your competition? And it’s that lack of complacency that I think is one of the chief reasons that Amazon, Apple, Facebook and Google have been so successful in all this they said there not content to say we go to that online bookstore and we’re going to get it back, they constantly got into new areas and some that return the stockholders said this guy is crazy I don’t want him running this company. Well, Jeff’s done pretty well by getting into all sorts of different areas. Last year Amazon made approximately 750 million dollars in essentially pure profit by selling excess compute power. As smart as Jeff Bezos is there’s no way it that when he started the company in 1994 Jeff Bezos said well this is the plan. Or Steve Jobs, I didn’t start the app store knowing that Angry Birds was going to be downloaded 40 or 50 million times, so when you take these risks and they wind up being successful, you can completely transform your business and that’s a lot, I think, it’s extremely difficult for companies to do because some people still think that you should stick to your knitting and I argue that no, if you say, run a barber shop, you probably should’t also do ballet lessons because there’s not a lot of overlap there, but hypothetically a chiropractor could also open up a massage practice or an acupuncture practice because those are certainly related parts of their business. Danny: So on that note, I want to kind of tighten in the conversation a little bit, I mean, you know you made that comment, or quoted I guess Larry Page quoting that, the comment that “marketing is kind of the price you pay for a bad product”. And I have to disagree there, I think, you know, expensive, bad marketing is the price you pay for a bad product. If your marketing is good then the product is part of that, you know? Product is just part of the, the alignment of value that you’re bringing to people along with everything else, right? Now in the spirit of tightening all that in cause you know, ultimately our listeners are not running Amazon or Google or, or Facebook or any of the above. They’re small businesses, much more like you and me than like the Gang of Four and something that I very much appreciate about your book is that you made very strongly the point that like, you’re using these four companies as examples, cause they exemplify and illustrate so well the concept of growing a platform kind of platformizing business that was not originally such with the expansion of planks and so forth, but its’ something that can be done at all different scales. You don’t have to be Amazon in order to do this. So maybe you could maybe talk to a little bit of how, how did that kind of transformation from a single competency business to platform with plans and so forth happen in your own business and what might that transformation look like for our listeners, for people in the 0-10 employee range who have products or services they may be online, maybe offline, and they’re looking for, for this expansion of market size rather than pushing to, to try to steal customers from somebody else. Which is going to be a pretty fickle customer anyway. Phil: Sure, and it wasn’t really difficult for me to throughout parallels between myself and a number of other businesses to the Gang of Four, so I’ll just use myself as an example and maybe I’ll mention one or two other ones that are in the book because, yes they are the four biggest companies and everyone’s actually heard of them, or should, unless you live in a cave, but obviously to your point, not every company has billions of revenue and tens of thousands of employees So just on a personal level and I mention this early on in the book, up until 2008, I made 90 something percent of my income from one very specific type of consulting and in 2008 when the economy was starting to falter I actually had my best year ever and I said to myself: “I’d better enjoy this because it’s just not going to get any better”. I was billable 51 weeks out of the year, I was juggling multiple client assignments and I said to myself, at the time I was 36 years old, “I don’t want the best year of my life financially to be already behind me because, again, I just can’t run the table like this it’s extremely unlikely to happen.” Plus do I want to keep doing the same thing over and over again? So I actually blew up my own business and over the course of three years, I wrote four books, stated a publishing company, started different types of consulting, started doing website design, I started pubic speaking, so I added these different plank to my platform, now again no one is going to mistake “Phil Simon Inc” for Amazon on many levels, but it’s all a matter of scale. So when small business owners talk to me and say, you know, “there’s nothing I can learn from Amazon, Apple, Facebook and Google.” I completely disagree. No you can’t spend 50 million dollars on an acquisition that may not pan out, or you may not have 100 employees who can spend 20% of their time like Google engineers famously do, on ideas that just interest them and may not actually go anywhere, but again it’s a matter of scale. What if you could personally spend 2 days a month on something that you’re not sure, so Pinterest might be of interest to you these days because it’s getting a lot of buzz and you want to play with it you want to start a Pinterest account you want to start pinning images and getting involved in that discussion. Is it going to work out? I have absolutely no idea, but give it a shot. What if you’re one of the first brands to embrace Pinterest, what if you do wind up picking customers up from there? Is it better to be on board that train rather than a year from now which everyone’s on Pinterest and this point what’s the differentiation strategy? So I argue that you do want to make a lot of little bets. And when I started a public speaking practice I had no guarantee that it would actually result in any money. Certainly getting public speaking gigs that pay, anyway, in a downward economy was not particularly likely. I did okay writing when most companies want to write for exposure but I was able to be successful along those lines and you know, sometimes there’s been a failure or two sometimes I’ve put out a book and thought it would sell more than it did. So anyone who wants sort of this roadmap or this five point plan or this game plan with a definitive end and, you know, how much time I should spend on Facebook, should it be 3.7 hours a month? You know I laugh, there’s just no way that you can be that certain. So in the book I talk about embracing that uncertainty and making these little bets, you know, Google is a great example with Google+, it’s by some accounts up to 90 million users, although those users aren’t really spending a lot of time on Google+ but that’s a separate discussion. What people forget Danny, is that this is actually Google’s fourth bite at the social apple. There was Orkut there was Buzz there was Wave. And each of those didn’t really succeed, so now that Google+ seems to finally be doing something right, Google seems to be doing something right with Google+ it’s just a testament to the fact that this was an important plank in their platform and they were going to keep trying until it “got it right”. That doesn’t mean that Google+ is going to supplant Facebook, Facebook just has too much of a lead, but I think that if something is really important, you have to take a few stabs at it and if it’s just not working then I do think you have to throw in the towel so for myself just as an example if public speaking didn’t work out, and like, you can’t keep doing it, but to me, if you’ve got books if you do consulting if you’re out there and talking to media folks and someone’s interested it’s sort of silly not to say: “Yes I will actually come to your organization, speak about it and I’d like everyone to get a copy of the book.” So again, to kind of summarize, it’s just a matter of scale. Danny: So let’s talk about, and I actually before we jump to the next point, there is something I want to just emphasize and underline cause I think it’s, I mean it’s implied very much in everything you said, but I think it’s very important for our listeners not to mistake this, you know this platformitization process – it’s not about looking at your core competence and saying: “okay, screw it, that doesn’t matter anymore, let’s just go in all possible directions,” right? You know Google is still excellent at search. Facebook at its core is about the connection of people to each other and allowing them to share, and so forth. Amazon still has a fantastic bookstore that drives a lot of their results. Apple has their computers, now it’s not to say that that is necessarily the, it doesn’t, I don’t know what portion of revenues for example books sales represent compared to everything else for Amazon or computer sales for apple and so forth, I know that the vast, vast majority of Google’s profits and revenues come from advertising and search. Danny: It’s very high. But like, the percentage isn’t, isn’t the key thing. The key thing is that you stick, you do stick to your knitting in the sense of “you do what you’re good at” and you continue to do what your good at and you kind of build on that and leverage that to expand into more things, you don’t just throw away your competence and say: “okay, you know the cool thing to do now is social media, let’s go do everything on social media.” But it, it’s there is a strategic nature to this growth. It’s not just random experimentation. Phil: Oh, I absolutely. And there is a fine line. By no means am I saying that search may not be around in two years so let’s leave all that money on the table, that would be silly, but you do have to prepare for the post index search world, just as you take care that your listeners may find interesting Danny. Something like only 20 to 25% of all time on mobile device is spent doing a traditional indexed search. People are texting people are playing games, people are on the phone, people are doing all sorts of different things beyond just Googling. So in a post indexed search world, which isn’t going to be tomorrow or the day after, but eventually down the road, there could be a change. How does Google stay prepared? So when I do my consulting, when I do my speaking or hold a workshop or something, I’m trying to help companies strike that balance. Because you’re right, you can’t get away from what’s making you money because you want to try ten different things all of which may actually not work out, so it is about certainly finding that balance and taking some risks but hopefully they’re intelligent risks. So again with Amazon, once it was selling books very well, selling CDs selling movies and isn’t that much of a stretch now selling crowd computing, that actually was a bit for a stretch, but Amazon needed all of that cloud computing power in order to run its business, so you’ve got this extra stuff and businesses want it, so why not sell it? So that was sort of a natural outgrowth. Danny: Yeah, it’s about leveraging competencies that you’ve already developed for whatever reason that was necessary. Phil: That was well said. Danny: So given that, how can that be, I mean obviously there is no such thing as you know “the five steps to rapidly platformatizing your business” or any kind of nonsense like that, but how would people start to look at their business as it is and recognizing that the attractive nature of platform is mostly due to the fact that it provides diversification, which is safer, and market growth which is more, you know, more business. What is kind of the first step, what are some things that people should be thinking about in terms of how to go about doing this? Phil: Well I’m thinking about a lot of small business owners, I would be remised if I didn’t say have a professional website. It sounds silly, but something like 60% of all small business owners from my research don’t even have a website. So if I want to Google a company and the first thing that comes up is Yelp or Google Places or Angie’s List, I just think that’s a major problem. So if you don’t have a professional web presence I think you’re really hurting yourself because anyone can, I look at this as signage. Alright? So if I’m driving past a restaurant and I’m thinking of eating there and it’s got a sign with a letter missing and the lights out and it’s dirty, do I really want to eat there? Probably not. Now again, having a professional website does not mean that I’m going to do all my business there because I still want I feel comfortable in it, you can have a professional website but not be able to meet the needs, it would be too expensive, but so to me that’s sort of table stakes having that professional website. One of the things that I mentioned in the book Danny, is that companies need to start using existing platforms as planks of their own. So it doesn’t mean that they have to spend all of their time on Facebook, but with 845 million people there, why not have a professional Facebook presence? Why not be on Twitter even if you’re not tweeting six times an hour right? Why not be on LinkedIn for individual discussions. So those are just two really basic things that, you know I think that some of it hinges on the business like I said before, if you are in one line of business another line may be totally arbitrary or irrelevant or unlikely to attract customers now to make that more concrete, if you’re in the website development business, why not launch a social media practice? Right? Why not establish a partnership possibly, so if you don’t have that expertise in-house, why not forge a relationship with another company and see how you can help each other out. Now some people weren’t comfortable with that? Right. Because it gets into this whole notion of “frenemies” and “coopetition”. Are you kind of helping somebody else steal business from you? That’s why to me the Age of the Platform really isn’t a technology it’s a management book. When you make your platform available for other developers, for instance let’s say you’re Apple with the app store you are creating your, you’re letting people create their own app. Now, you have a software development kit that anyone can download that kit and submit an app to the app store now that arguably is dangerous for Apple right, because it doesn’t control everything, even though apple is kind of different because it technically is kind of a closed ecosystem. It’s not Android where anyone can develop anything. But that’s kind of a risk. Some companies aren’t comfortable, some companies only want the innovation and all the proprietary knowledge to exist inside. Well again that’s I think very dangerous if we take a look at a company like Twitter. Twitter makes its Application Programming Interface, or API open such that people can build whatever products and services they like. And the number of innovations based on Twitter’s API is nothing less than astounding. We’ve seen HootSuite that sort of segments Twitter streams into more manageable pieces we’ve seen sites like TwapperKeeper that let you sort of search archived Tweets, or we’ve seen so many different things like polls through real-time Tweets. Let’s say that, you know, 95% of those apps and there are about a million of them that went up on Twitter are actually garbage and they don’t work. Okay fine, well that’s 50,000 great apps that actually can take Twitter in a different direction. So it’s about in some ways, sort of letting go of control and letting the community or the ecosystem take your product or service possibly in a different direction and I know that makes a lot of people uncomfortable. Danny: Well, I mean, let’s put aside the discomfort which, I mean, is definitely real and in some cases legitimate, I mean, you know, when you see a business, when you see your business having growing in a direction that is not what you intended to be in that’s not your core competence you’ve got to sort of ask yourself questions: do I want to fight this and keep it in a different direction, which is sometimes the right answer? Or do I want to go with this and you know, run with the opportunity and develop my competence in a new direction? That’s also sometimes the right answer. But I want to speak to this, or rather I’d like you to speak to this question of, you know like you said opening up, Twitter has their API anyone can be creating apps for it and that can kind of strongly influence the direction in which Twitter evolves. It allows the community to dictate where they want it to go. Most small businesses are not Twitter; they’re not even necessarily in the technology space. Let’s say you’re looking at, you know, service businesses or you’re selling products or, like, what is this going to look like when taken down like several orders of magnitude to the reality of the small business owner? How do you interface with your community, what does that community look like, how, what is the way in which they can influence that growth? Danny: Nor does he have, and I see this as like a key thing I’d like to speak to, nor does he have a community of like a million developers interested in taking his business in different directions, so like, what does the community come from? Phil: Right, well he doesn’t have a million envelopers but he does have customers and he could potentially have users and visitors potentially on his site or Facebook page so one of the things I’ve been impressing upon him is use the existing platform and planks of your own, it’s you’re, you’re not attracting a developer right, and he’s reasonably familiar it with a computer so he’s able to get some things don’t, but it doesn’t take I guess a technical background in order to produce a professional podcast. There are tools out there that make that quite easy if you’re computer literate. It doesn’t take very long to create a useful video and publish it on YouTube or Vimeo. It doesn’t take long to blog and to throw 300 words out there such that, let’s say, forget the guy who lives in New Jersey and runs a wellness center. Maybe I’m in say, California and I’m Googling how to take care of my back and I come across a blog post that he wrote because maybe he tweeted it or maybe Google indexed it and I’m saying to myself this is really interesting, so I watch his videos and no, I’m not going to get on the plane and go to California to New Jersey to have my back looked at, but what happens if I actually have some friends in New Jersey or New York and say: “hey you gotta check this guy out,” and it, it can wind up using the community while it may not be a technical community the way that Twitter would, I would argue that it’s still a community, it’s still possibly to reach people, even if it’s simply sharing content. And I think that’s the beauty of the web you’re able to reach people that we normally could not have reached because you weren’t going to send a newsletter out to the entire world. So I would argue that again, the tools are out there and they’re not as technical as they maybe used to be. You don’t have to be a computer programmer to basically have a website set up where you’re making very professional, I’m a big WordPress guy. It does take 5 minutes to start a Twitter account or to log into Facebook. Well what are you doing with those existing platforms, how can you make them a part of your own? I would argue that any business can strike the right balance but to your point there isn’t a 5 point checklist, I can’t tell you that you need to use one or another. That’s why I’m a big proponent of experimentation, right? So, if Twitter’s not working for you and it’s not resulting in traffic or business and when your customers come in you say: “how did you hear about me?” No one’s saying Twitter? Okay, you know don’t spend time on Twitter, that’s a judgement call, but again, why not try it out for a little while? Danny: Something that you said there is, I want to just kind of underline and emphasize it. You know, it’s only recently that the word community has come to mean almost exclusively things that happen online. Community’s existed for a very long time we’ve had communities for a very long time and you know, just like you said, customers walk in the door and you say: “how did you hear about us?” And you say, you know: “what else might you like?” You know you have those conversation, your customers are your community, they don’t have to be writing apps in order to direct the development of your business. Danny: If a person is interested in the content, it’s because they would also may be interested in the service, it’s not random. Phil: Right, one would hope. And that’s why I give away the first chapter of the Age of the Platform website or at the AgeOfThePlatform.com and some people say why would you do that? Because if they’re interested then they’re going to buy the rest of the book or call me for consulting. Again, that’s very different for a lot of people, they don’t really see necessarily the value in that. People who haven’t embraced the web or haven’t embraced social media or blogging or creating video or some of those things. So it is a shift in mindset for a lot of people, the same way that the platforms giving away control, again, often doesn’t really resonate with them so, I’m a big believer that this is not a book with which everyone is going to agree. It does sort of have these big ideas, and there is a chapter on the “how”, I think it’s chapter nine, that does lay out some specific tips, but it is about a new way of doing business and not everyone is comfortable with it. So my opinion, the company that do get comfortable with this are going to have more success all else equal than the companies that don’t. In the book I make the point that if you sell beepers and you’re trying to build a platform, well good luck with that because you know what, No one buys beepers anymore. So platforms are not a panacea and not an elixir, but if you are embracing them and have already, you’re going to be more successful than if you’re not. Danny: Yeah, and the very close to home example of you know platformitization and planks to a certain extent is my own experience with Engagement from Scratch!, right? We grew Mirasee and I did a huge amount of guest posting, building relationships on all these other larger blogs which can be seen as planks, extending my platform, and then Engagement from Scratch! was written and published and given away for free in exchange for an email address and a name. Which a lot of people are like: “what are you doing? People aren’t going to buy!” But you know, it’s what grew a large part of the audience that we have now. And so you know, that’s very much an example of you know, new planks, new planks, new planks. and kind of comes to a question I’d like to speak to a little bit which is, how do you decide which, I mean, everything is a gamble to a certain extent, not like a crazy, you know, we’re throwing our money away, but you know, you don’t know for sure if it’s going to work. There are always more ideas than there’s time in which to do them, and while I agree with you that it’s very important to try new things and experiment because if you’re not its stagnation, the kiss of death. I‘m sure you’ll agree that that doesn’t mean that you can try everything all the time all at once, because you know there just aren’t that many hours in the day and you end up scattered and unfocused and getting nothing done. So what kind of decision criteria might our listeners find useful in terms of saying, you know: “I’ve got six cool ideas of directions I could expand into, how do I pick which one to start with?” Like, what should I be looking for? What should I be considering? What should I be thinking about? Phil: That’s a great question. I would think that certainly cost is first and foremost. So starting a Facebook page, I would argue, takes very little cost. No you can create custom Facebook pages like I had done for the Age of the Platform which has sort of the bells and whistles and that was more expensive than just setting up something on my own, but I guess that in my opinions the squeeze was worth the juice. So you don’t just want to look at cost, you also want to look at time, and I would also argue, well what’s the risk for failure. So if you start a Facebook fan page right, and nobody joins does that really cost you anything? That’s a lot different than spending $50,000 launching a new product, and that doesn’t go anywhere. So what are the, I guess what are the opportunity costs? Not just money but also time, and what are the costs of failure. To me, like I said if I’m starting a website design plank on my own platform and nobody takes me up on it that’s okay, because I do other things to pay my bills and these days it is so inexpensive to start with a new business or a new line of business, I mean, I can launch a new line of business by adding a service page to my website. It doesn’t mean that anyone’s going to come and take me up on it. But there is a sort of balance that you have to have. You can’t, and we’ve seen with with Google, when Larry Page took over as CEO last June, one of the first things that he did was to basically abolish a lot of these sort of quasi-interesting projects that Google had going that yeah, they were kind of cool, but were they really going to go anywhere? So Page pulled the plug on a lot of these lab-type products. He wanted to make Google a much more focused company. Again letting an engineer kind of tool around in some virtual good is a lot different than say Google Glasses which is a product that’s supposed to come out at the end of this year which actually is more in the way of hardware and development cost, so again, I would look at the time, the cost and really the potential downside of failure. Danny: Plus the potential upside of success. Phil: Well, that, that’s tough, because I just don’t have a crystal ball, and I think that a lot of these experiments for lack of a better term have uncertain rewards, right? I mean there, if you are the first to market that’s probably a fleeting type of thing. I mean these days, and I write about this in the book, there really aren’t any sort of physical barriers to entry. If I wanted I could spend about $30,000 through a site like eLance and build my own bookstore. Now that doesn’t mean that anyone’s going to buy books on it because Amazon has made it so incredibly easy and they’ve built up trust with their customers, they’ve got all this credit card information they’ve got great customer service with Amazon Prime, shipping is off the charts easy… So just because you can doesn’t mean that you should. So I think that you also want to take a look at your existing competition, I think that you’d be really challenged to start a search engine these days, because despite its recent privacy problems, Google is the 800 pound gorilla. So for me, I tend to focus more on what could go wrong, I don’t totally disagree with you that you have to look at what may go right, but I just think it’s incredibly difficult to say: “well if I spend $20,000 on X, this is my upside.” Because you could be wrong in either direction by an order of magnitude. You know? I would look at say Facebook, right and in hindsight, like, it’s so obvious right? I mean why wouldn’t you want a social network that basically connects you to all of your friends, right? Okay well here’s the rub: Facebook, and I write about this in the book, wasn’t by any stretch the first social network. There was Friendster and there was ClassMates and there was MySpace. Well all of those sites are basically dead, and even if you go back ten twelve years to the previous sort of tech titans Yahoo!, AOL as I said before, MySpace, even Microsoft to some extent, these platforms guarantee nothing. So you have to be nimble, you have to kind of keep evolving. So I think that often times, I agree with you, you want to be concerned about the potential market and the upside, but how can you possibly predict that? I mean as smart as Mark Zuckerberg is, there’s just no way he could possibly have possibly said that he’d create a social network that nearly connects a billion people and is going to be worth upwards of a hundred billion dollars. But there’s always that chance, I agree with you. It’s just that, you need to sort of concrete proof that if you put in X you’re going to get back 5X. What are the odds that that’s going to happen? I just don’t buy it. Who would have guessed that Twitter brought about the fall of what, 4 dictatorships in the Middle East, in the Arab Spring? Where was that in anybody’s 5 year plan? Danny: Seriously, and I think you made a really good point: just because you can start a bookstore or a search engine or whatever, doesn’t mean you should and it just comes back to the whole market share vs. market size question, right? Growing your platform is not by saying: “this is what somebody else is doing, I’m just going to try and take their customers away from them.” But you need to be a little more creative than that, and look for actual areas where you can add stuff to the people you’re dealing with, rather then trying to take people away from, from somebody else. It’s just a very non-constructive way of looking at things. We’re, we’re coming up kind of close to the hour and I don’t want this to stretch on too much longer, there is one last question that I’d like to ask you that I make a point of asking everyone that, that we interview here at Mirasee, and it’s because we think that, you know as great as theories and ideas are, it’s very important to turn those things into practice, and you know we, we’re fortunate to have had some very wonderful speakers and interviews, and it’s easy to get excited about what they say, you know: “this is great, this is exciting, I’m totally sold, I love what I’m hearing.” But then there’s a question of application, so, you know, we’ve got a whole bunch of people who are going to be listening to this or reading the transcripts. Let’s say they listen to this interview and they’re sold: “Platforms, this is it. This is exactly what I need to do for my business,” and they recognize the importance. They clear 3 hours this afternoon to do something. Obviously you can’t take over the world in 3 hours, but what should they do with those three hours. Like how would you recommend that they spend that time? Phil: Beyond, listening to this interview and buying the book? Danny: Yeah, they, they just listened to the interview, they’ll buy the book, and they’ll arrive, the hardcover will arrive in a week maybe, but this afternoon, what should they do? Phil: I guess we’re talking about small businesses? Phil: okay, let’s say this: solicit feedback from others, honest feedback, not from people who are just going to say you’re doing a great job. Start off with the website, say what do you think? How often to people actually do that kick the tires on your own website. Ask yourself objectively, for instance, what would you do if you were sort of one step removed from it or detached from it? Could you find stuff, is it laid out easily? And then ask yourself: Are you active on other sites? Because think about it, if your only active on your own, what are the odds that someone will find out about your site vs. Being active as I said on Facebook or LinkedIn or Twitter or the different social media sites, you could be on that. Now are you blogging? Are you, say, posting those blogs to some of those sites. Are you creating videos, are you commenting on other people’s blogs? Right? I tend to find that with social media you can build what Seth Godin would call a tribe, and I think it’s very presumptuous just to assume okay well I’ve got a site, I’ve got a blog, I’ve got a book I’ve got a podcast, they’ll start coming. Well that may be but are you really participating in the conversation? So often times I will comment on other people’s blogs, and hopefully it’s not something as obvious as: “great post, check out my site because I’m super smart!” But hopefully I am contributing to the conversation, because ultimately you want those conversations to take place. Beyond just asking the world at large. I would say don’t necessarily do a post-mortem, because that kind of has a negative connotation, but if you think about the last ten clients that you’ve had, what kinds of things were you able to do well, what kinds of things were you not able to do, and do you see any kind of trends? For instance as I said before, If you do social media, How many sites would you kind of help with social media but their website wasn’t very good. Does it make sense for you to find a good web developer and if not hire that person, then at least maybe take that person on as some kind of partner or start some kind of alliance or relationship because you think that you can kind of funnel work each other’s way? And I would say, finally, ask yourself if you’re ready for platform? Again, there is a long chapter in the book about how you can start to build one, but to your point, you’re not going to take over the world in three hours Danny, so ask yourself if you’re committed to the long term. I argue in the book that, for instance there are actually now Indian accountants who can do American taxes very cheap and very well, and if you’re a mid forties accountant and you just kind of want to coast in your career, you’re going to be able to do that, to quote Tom Friedman, the world is truly flat, so are you going to be safe in that kind of world? And if you’re competing on cost and you’re leaving other kinds of things on the table, ask yourself how long that can actually sustain itself because I think that if you’re really honest with yourself you’ll probably find that competition can come from anywhere very, very quickly, and if your business isn’t prepared for it, what are you going to do? Danny: Absolutely, I couldn’t agree more Phil. So tell us where can people find out more about you, more about what you’re doing and more about Age of the Platform? Where should they go? Phil: Sure. The site for the book is AgeOfThePlatform.com my main site is Phil Simon Systems and on Twitter I’m @philsimon. Danny: Wonderful, so people, you know where to go right now to learn more, you should check out this book and you’ve got your work cut out for you this afternoon, clear three hours and get to it. Phil, thank you very much for being on the call with me today, it’s been a lot of fun, it’s been a fun conversation and I’m sure the listeners are going to enjoy it as much as I did, so thank you very much. Phil: Thank you Danny I enjoyed it. Danny Iny (@DannyIny) is the CEO and founder of Mirasee, host of the Business Reimagined podcast, and best-selling author of multiple books including Engagement from Scratch!, The Audience Revolution, and Teach and Grow Rich. I had a question that came up reading other parts of this series, but it fit in best now I think and that is, why don’t you have share buttons on each of your blog posts? I actually just realized that the other day. My feeling/understanding is that a key element to growing your audience (market size or share) and spreading your information is to make sharing easy for your existing audience. The two main ways to get found are search and share, and with more and more search results being affected by social shares, guess I’m not sure why you wouldn’t have the buttons to make it easier than cut/paste manually doing it if they should choose to. I thought that might be the case, but usually I see at least part of those. I don’t see them at all. The issue is probably that I have an older monitor (if it ain’t broke… :-)) The other issue that I run into with that kind of button strip sometimes is that they obstruct that left side, occasionally it’s been to the point where I can’t even get to necessary stuff underneath including comment buttons.